I always like to have a vase with flowers on the dining room table, especially bright yellow or orange flowers. I feel like they really brighten up my day! 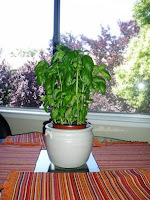 But lately, my flowers have been replaced by my favorite herb in the world: basil! 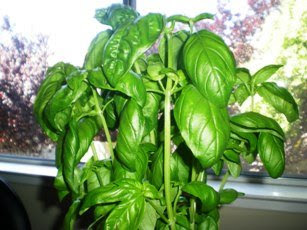 Question: Do you like basil? What's your favorite way of eating it? I've got a pasta salad recipe that is basically like #2 on your list.... basil, tomatoes, mozz, olive oil, YUM! Last year we had these weird beetles eating our basil plants, I had to go out every morning and knock them off the plants and into a cup of a water. They were creepy!! I love the idea of growing herbs inside...never really thought about it I guess! Thanks for the comments on my new blog, I was worried that it wouldn't get the response the other one did. I'm getting my shoes on Saturday, I'll post a picture. Nothing exciting, just new tennis shoes! I am growing mine outside, but it is so hot and it's going to seed though I keep pinching it back. Tomato salads are my favorite way to use the basil.